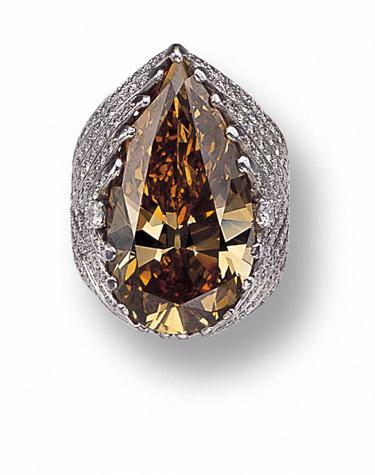 The pear-shaped fancy to Fancy Dark Yellow-Brown diamond weighing approximately 27.25 carats, within an openwork platinum mounting accented with 186 small round diamonds weighing approximately 3.80 carats. Accompanied by GIA report no. 11859872 stating that the diamond is Fancy to Fancy Dark Yellow-Brown, Natural Color. The ring sold for $113,525 US. The ring was featured on page 64 in The Power of Jewelry by Nancy Schiffer. Published by Schiffer Publishing Ltd. They enclosed at note at the front of the book that it may be purchased from the publisher. Their address is 1469 Morstein Road, West Chester, Pennsylvania 19380. Amazon.com also has the book. Here's the link.